This entry was posted in Vacuum Tubes and tagged 12au7/ECC82, 5963, GE by tubemaze. Bookmark the permalink. 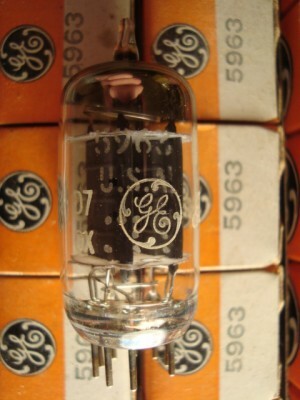 It’s so rewarding to find a great tube especially from a company that is not know for making great tubes. This time GE did a very nice job. As far as 5963 go, I think this take the crown. Great balance across the whole audible spectrum, tight/controlled bass, fantastic transparency and on the top of that a touch of warmth in middle. I compared the tube to RCA5963 and was quite disappointed by RCA – it’s much softer and muddier than GE (I can’t believe I just said that 🙂 ). This tube is being not well known is one of the treasures that gives you a fantastic sound and costs that much. The only downside with the tube… it’s really hard to find. RECOMMENDED.